There will be an informational meeting for anyone interested in trying out for girls soccer on Monday, November 20th at 3:45 in Mrs. Gilmer’s room (B-105). Senior bulldog, Maggie Black, has committed to Anderson University to play soccer for the Trojans. Maggie has been a standout for the Lady Bulldog’s soccer program earning Region I-AAA honors and All-State honors in AAA. She was also named to the Independent Mail All-Area team. Congratulations to Maggie Black! Wednesday, May 3, 2017 6:30 PM Gettis D Broome High School AWAY 1 Pendleton High School HOME 3 Game Recap The Lady Bulldogs beat Broome 3-1 in the second round of playoffs. Goal scorers were senior Elizabeth Barnes (1) and sophomore Mollie Jones (2) Their next game is Friday at 6:00 at Powdersville. 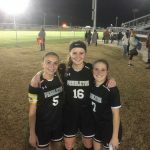 Monday, May 1, 2017 6:00 PM Palmetto High School AWAY 1 Pendleton High School HOME 10 Game Recap The Lady Bulldogs defeated the Lady Mustangs on Monday 10-1. The Bulldogs will host Broome next on Wednesday at 6:30. 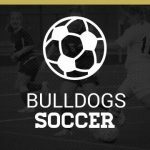 Thursday, March 30, 2017 6:00 PM Pendleton High School AWAY 5 Crescent High School HOME 1 Game Recap The Lady Bulldogs defeated the Lady Tigers Thursday night. 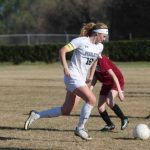 Lady Bulldog, Eliza Shaw, was named the MaxPreps Female Player of the Week for the state of South Carolina. This honor was based on her on-field performance for the week of March 21st-28th. Read more on MaxPreps here.